Shane McGinty's deflected shot four minutes from time makes it six as Ballymena crush Institute. Adam Lecky tapped in on 76 minutes to restore Ballymena's fourth-goal lead after Paul Smith gave Institute a glimmer of hope with a classy curler into the top corner after 55 minutes. Leroy Millar ensured Ballymena went in 4-0 up at the break after Ryan Mayse's superb double and an Albert Watson strike put title-chasing United in control at the Showgrounds. Mayse cracked into the top corner from 25 yards for a brilliant opener before smashing into the roof of the net on 23 minutes. Watson scored third three minutes later by firing into the bottom corner and then Millar glanced in from a Tony Kane corner in the 37th minute. Institiute missed the chance to take a fourth-minute lead when Ross Glendinning saved an Aaron Jarvis penalty. 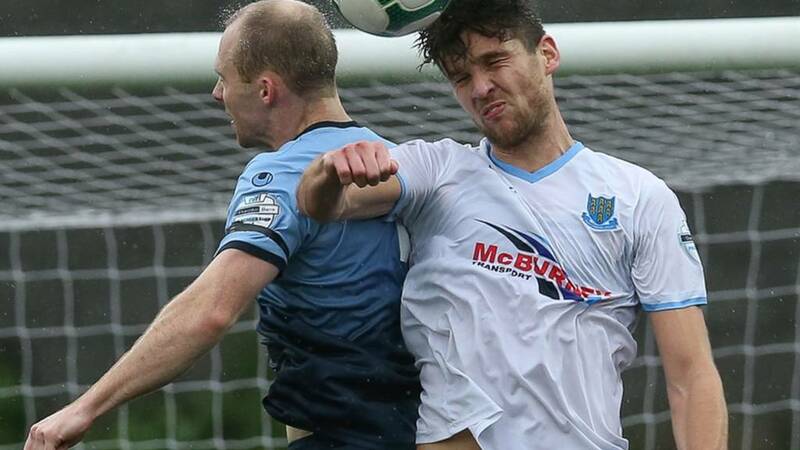 Ballymena Utd: Glendinning, kane, Quigley, Addis, Mayse, McGrory, Winchester, Ervin (capt), Lecky, Millar, Watson. Subs: Williamson, Whiteside, McGinty, Burns, Shevlin, McMurray. Institute: Gallagher, R Morrow, C McLaughlin, Bonner, D Curry, J Morrow, Jarvis, McIntyre, McCready, Smith, Leppard. Subs: Kelly, Dunne, S Curry, Moorehead, Scoltock, E McLaughlin. Video caption: Mayse scores another brilliant goal to make it two!Mayse scores another brilliant goal to make it two! Video caption: McGinty makes it six!McGinty makes it six! Crusaders turn it around with three goals in the second half. Buoyed by the introduction of Jordan Owens the Crues look a completely different proposition with goals from Matthew Snoddy and Billy-Joe Burns coming before Simon Kelly heads into his own net. Lee Duffy had put Warrenpoint ahead just before the break with a low free-kick that beats Sean O'Neill at his near post. Earlier Conall McGrandles saw his header cleared off the line by Snoddy. Warrenpoint Town: Türker, Hughes, Reilly, McGrandles, Scannell, O'Connor, Wallace, Donnelly, Hernany Marques, Duffy, Young. Crusaders: O'Neill, Burns, K Owens, Coates, McChrystal, Snoddy, Lowry, Thompson, McGinley, Ronan Hale, Patterson. Subs:G Doherty, Beverland, Ward, Cushley, Ruddy, J Owens, Brown.